Following an accident in which Steve Terebecki crashed the tour van into a science lab where a top-secret rock ray was being developed, he had the ability to turn himself into a car that can fly for some reason. No one aside from his band mates White Denim and their buddy Pockets the sheepdog, know his gas-chugging secret. This entry was posted in illustration, t-shirt and tagged White Denim on June 25, 2012 by Josh Latta. Hey, check out this shirt I got in the mail! Dig it! 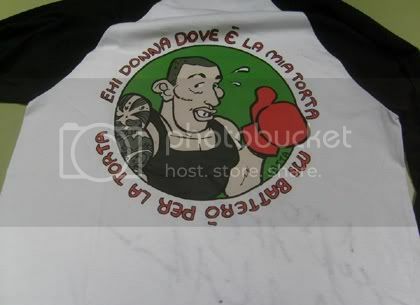 The shirt is signed to me by Alessio Andolina, the Italian Savate champion. I also got an unsigned version for bebopping all over town in with style. Thanks Paul, for this ultra fun project and thank you Alessio Andolina for the presents. I do so love getting mail! 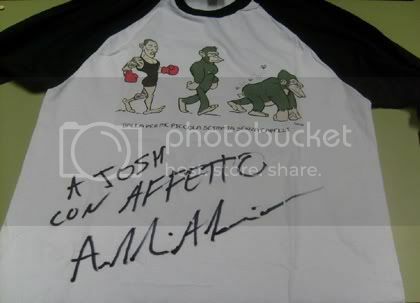 This entry was posted in illustration, t-shirt and tagged t-shirt on June 11, 2010 by Josh Latta.